Omar issued a statement on Sunday night saying: "Since the president's tweet Friday evening, I have experienced an increase in direct threats on my life - many directly referencing or replying to the president's video." "I find her comments to be absolutely disgraceful and unbefitting of a member of Congress," Sanders said, "and I think that it's a good thing the president is calling her out." "The president is wishing no ill will and certainly not violence toward anyone," said Sanders. "But the president is absolutely and should be calling out the congresswoman." Omar has come in for a drubbing from the right over a snippet from a speech last month to the Council on American-Islamic Relations (Cair), in which she discussed the problem of Islamophobia and described "the discomfort of being a second-class citizen". "Cair was founded after 9/11," Omar said, "because they recognized that some people did something and that all of us were starting to lose access to our civil liberties". In response, Trump tweeted, retweeted then pinned atop his Twitter account a video splicing footage of Omar's remark with video of the 9/11 attacks, including planes striking the World Trade Center and the Twin Towers falling. 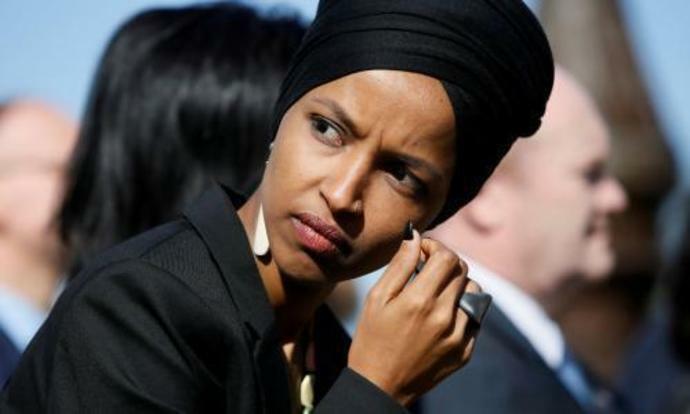 Supported by a wave of Democrats saying Trump was wilfully misrepresenting comments by Omar in what amounted to dangerous racist bullying, the congresswoman on Saturday said she would not be silenced by "an administration that ran on banning Muslims from this country". "No one person - no matter how corrupt, inept, or vicious - can threaten my unwavering love for America," Omar tweeted. Trump's attack amplified a cover run by the tabloid New York Post, owned by Rupert Murdoch, which splashed a quote from Omar over a picture of the World Trade Center in flames. In response, a group of New York City corner-store owners announced a boycott of the newspaper. The Yemeni American Merchants Association, which represents Yemeni Americans who own and run an estimated 4,000 to 5,000 of the city's thousands of delis and corner stores, known as "bodegas", wrote that the front page "provoked hatred" and "aims to harm Omar and her family and other people of the Islamic faith". "This rhetoric threatens the safety and wellbeing of Omar, Muslim leaders, and the larger Muslim American community at a time when Islamophobia is at an all-time high," it added. Andrew Gillum, a former mayor of Tallahassee who made a strong run in 2018 for the Florida governorship, said on CNN's State of the Union Trump was making a racist attack on Omar as part of his strategy to win re-election. "Obviously Ilhan has become a little bit of an easy target for this White House, for this administration," Gillum said. "But I think his attack is beyond congresswoman Omar. This is about the fact that she looks a certain way, she is a woman of color, she happens to be of the Muslim faith. The president is setting, in my opinion, the groundwork for the kind of campaign he wants to run, which is to pit Americans against Americans, to turn brown and black people against his base." Omar apologized "unequivocally". But she has declined to do so over her 9/11 comment. "I did not run for Congress to be silent," she tweeted on Saturday. "I stand undeterred to continue fighting for equal opportunity in our pursuit of happiness for all Americans." "Enough is enough," she wrote. "No more silence, with NY Post and now Trump taking Ilhan's words out of context to incite violence toward her, it's time for more Dem[ocrats] to speak up. Clearly the GOP is fine with this shameful stunt, but we cannot stand by." Senator Bernie Sanders called attacks on Omar "disgusting and dangerous" and said Omar would not "back down to Trump's racism and hate, and neither will we". Senator Elizabeth Warren said: "The president is inciting violence against a sitting congresswoman - and an entire group of Americans based on their religion. It's disgusting. It's shameful. And any elected leader who refuses to condemn it shares responsibility for it." Trump's own controversial remarks and false claims about September 11 have come under renewed scrutiny. Speaking on CNN's State of the Union on Sunday, the New York congressman Jerrold Nadler, whose district covers lower Manhattan, said he was not offended by Omar's remarks because she referred only in passing to September 11. "He stole $150,000 from some small business person who could have used it to help rehabilitate himself," Nadler said. "He has no moral authority to be talking about 9/11 at all."